The current EB-5 regional center program reauthorization expires December 8, 2017. The questions for those in and watching the EB-5 industry are:Will we have long-term EB-5 reauthorization at last? What will be the new investment amount? What will be the new TEA definitions? When will be the effective date? 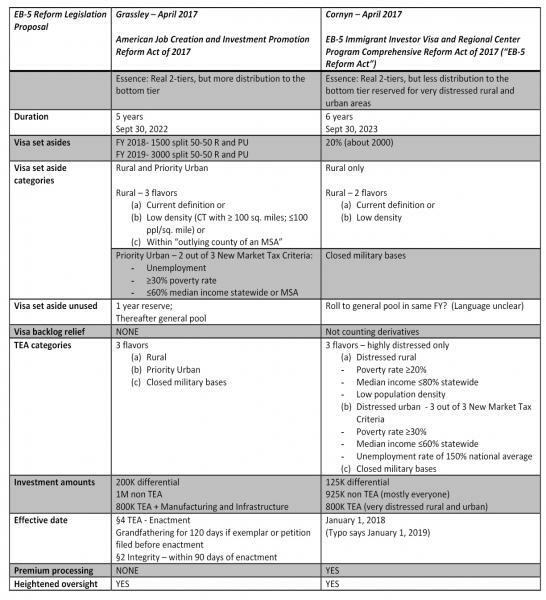 What projects will qualify for visa set-asides? Is there any visa backlog relief in store? Will there be heightened program oversight? Earlier this spring, two highly influential Senators introduced their visions of EB-5 reform legislation answering these questions. Senator Chuck Grassley (R-IA), the Chairman of the Committee on the Judiciary, released his draft entitled, American Job Creation and Investment Promotion Reform Act of 2017 in early April 2017. Senator John Cornyn (R-TX), the Senate Majority Whip, introduced his counterpart draft entitled, EB-5 Immigrant Investor Visa and Regional Center Program Comprehensive Reform Act of 2017 in late April 2017. This piece comprehensively compares the two drafts along the main issues of interest. Insiders report earnest discussions have been ongoing throughout the summer between the principal legislators including Congressman Bob Goodlatte (R-VA), Chairman of the House Judiciary Committee, brokered by Leadership in both chambers of Congress. EB-5 industry lobbyists have remarked on the extraordinary nature of the interest shown for a relatively small federal program, in the vein of predicting positive outcome for agreement. These discussions are still progressing. Key reform elements are evolving from their April starting points. Complex negotiations between members and EB-5 industry players are underway. While one cannot predict where we will be on December 9, 2017, and how the puzzle will ultimately come together, the below comparison should shed light on the contours of the biggest moving pieces.